A memorial tablet in Bombay (and in Scotland). Episode: 8. Site Numbers: 170 & 171. Date Posted: 18 May 1996.Update 7 March 2000. Location: Bombay, India & Rothesay, Scotland. Type: Memorial. To the Glory of God and sacred to the Memory of Henry Robertson Bowers a lieutenant of the Royal Indian Marine who lost his life in the Scott Antarctic Expedition on the return journey from the Pole, on or about the 27th March, 1912. Aged 28 years. 'As the troubles have thickened about us his dauntless spirit ever shone brighter and he has remained cheerful, hopeful, and indomitable to the end' R. F. Scott. This tablet was erected by his brother officers on the active and retired list as a mark of their admiration of his zeal and integrity at all times." Rothesay is on Bute not far from Greenock where Bowers was born on July 29, 1883. We know the memorial tablet was installed there (at St Ninian's Church) because it's illustrated opposite page 96 in Seaver's biography, 'Birdie' Bowers of the Antarctic. But what about the companion version in the Bombay Cathedral? 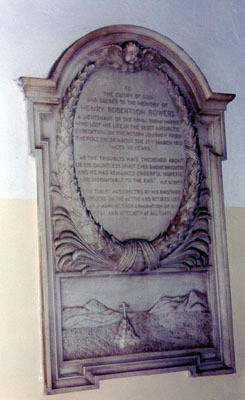 Bowers served in India and spent time in Bombay so there's every reason to think that such a memorial is, indeed, there. Can anyone confirm this? 7 March 2000. Russell Kevin Coote was kind to confirm the existence of the memorial in Bombay and even to provide photographs, some of which are added here. The Bombay Cathedral is St. Thomas. 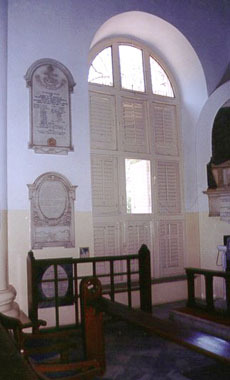 A plaque on the door reads: "Our beautiful cathedral, the oldest English building in Bombay, has been since 1718 the centre of Bombay's christian worship. Completed 1718, consecrated 1816, dedicated to St. Thomas the Apostle, who brought the gospel to India, St. Thomas's became a cathedral in 1837 when the See of Bombay was founded. Its fine 18th and 19th century memorials reflect a part of India's history." The inscription on the Bowers memorial is identical with that given above and the design of the two tablets is the same, too (including the scene at the bottom showing the snow cairn). It is attached to the wall of the left aisle with other plaques above and below it.